A survey by PricewaterhouseCoopers (PwC) has found that banks racing against time to meet the BoG’s GH¢400million minimum capital requirement by end of year would rather explore other options than merging with other banks. According to the survey, which was on the theme ‘Having secured the new capital; what next for banks?’, most banks are not very optimistic about mergers and acquisitions as an option for meeting the new capital requirement – with the survey averring that banks prefer to avoid the usual post-consolidation issues and associated costs which come with this option. The PwC 2018 Banking Survey asked some key staff of participating banks which options they prefer for raising new capital to meet the BoG capital directive, and mergers and acquisitions was ranked last by the respondents. The central bank’s directive on banks to recapitalise provided three options for them to consider: capitalisation of income surplus; a fresh capital injection; or a combination of both. Although the central bank directive was not explicit on consolidations, given the sheer number of weaker banks it was implicit that consolidations would be a lifeline. But the PwC survey that spoke to bank executives – Chief Executive Officers, Chief Risk Officers, Chief Finance Officers, Chief Operation Officers and Heads of Strategy – noted that the majority of respondents would rather rely on their income surplus. “A few respondents also indicated that this option, although preferred, was out of their reach considering the current size of their reserves. 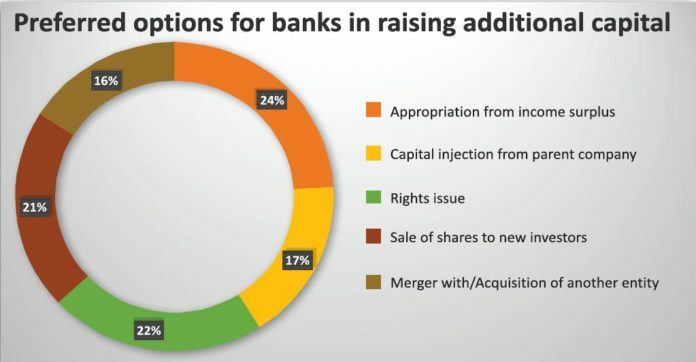 Although the banks’ preference generally leans more toward reliance on reserves, for fresh capital injection banks will be required by law to explore a rights issue option first. “Most banks are therefore forced to consider a rights issue as one of the more realistic options to be explored. Most banks surveyed also appear to lean more toward the sale of shares to new investors,” the survey revealed. This, PwC noted, is influenced by banks’ belief that the likelier source of fresh capital will be from new investors rather than existing shareholders. Some banks are however concerned about the possible dilution of ownership interest that comes with sale of shares to new investors, the banks’ executives feared. Most local banks surveyed view capital injection from their parent company as the least realistic option for them, as this option applies to only a few foreign-owned banks which can rely on their parent entities. “We however noted that the few which expect fresh capital injections from parent banks generally consider this as a back-up plan should they be unable to raise the new capital on their own,” the survey said. Commenting on the survey’s findings, Mr. Ashiagbor said although it was not disclosed as an express objective of the minimum capital increment, the industry has seen some amount of consolidation already – even though these have been regulator-induced based on the deteriorating asset quality, inadequate capital and liquidity challenges faced by the merged banks. “We expect that the industry will have experienced some more consolidations by end of the 2018 financial year,” he predicted. while five other local banks have had their licences revoked by the regulator and their businesses consolidated into one entity – now called Consolidated Bank Ghana (CBG) Limited.